Slim your entire body to streamline your back. Whether you call it a muffin top, love handles or back bulge, no number of cute names can make you feel better when your back fat spills over your skinny jeans. Of course, no amount of crunches alone will get rid of that stubborn overhang either. That's because it's impossible to spot reduce just one area of your body. If you want to nix the muffin top, you'll need to incorporate a weight-loss and toning program that targets your midsection so you can slide into your skinny jeans again. Begin an exercise routine that requires at least 30 minutes of cardio five times per week plus two to three days per week of strength training. This is the amount of exercise recommended by the Centers for Disease Control and Prevention and will help support your bid to get rid of your back fat pronto. Cardio burns calories, while strength training helps build new muscle, both necessary for weight loss. When planning your exercise for the week, add in exercises that specifically target the midsection, obliques and back. While you can't spot reduce your love handles, you can tone them as part of your regular workout. For instance, a set of burpees can help target your midsection as you go from a crunched to a plank position and back again. Another effective exercise is the side plank, as recommended by Weight Watchers. Start in plank position and then push your weight onto your right palm, extending your left hand in the air so your arm creates a straight line. Hold for three to five seconds and repeat on the other side. Your diet is partially responsible for excess fat in your body. While exercise can help you tone up and feel better, you won't get real results until you retool your diet as well. Belly bloat can often be the culprit for extra weight around the midsection -- drink plenty of water and eat foods high in water content like melon and cucumber. Then, focus your diet on lean protein and complex carbs like fruit and whole grain. Refined carbs -- like the kind you get with white bread, pasta and sweets -- should be avoided, since they contribute to the trigger of fat storage in your belly, warns Kathleen S. Hosner in her book "Full Heart Satisfied Belly." While you can get your booty on a treadmill, eat a perfect diet and plank all day, your efforts will be in vain when you don't wear clothes that fit. In fact, too-small pants can make you feel like you're bigger than you are. Ditch the clothes that don't fit -- a waistband that digs into your sides and back and causes overhang and discomfort is a dead giveaway -- and get fitted for jeans that make you feel great. Choosing pants with a higher rise and with around 2 percent spandex can make you look sleeker and more svelte as you continue the weight-loss process. Does Cutting Out Carbs Shrink & Flatten the Stomach? 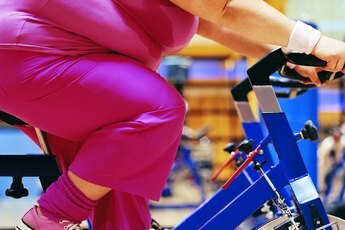 Can Exercise Bikes Work on Back Fat? Does Walking Slim Down Your Stomach & Back?